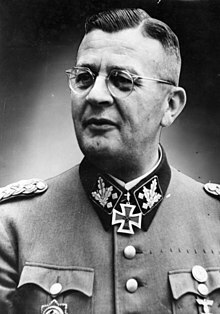 Erich von dem Bach-Zalewski (March 1, 1899 – March 8, 1972), born Erich Julius Eberhard von Zalewski, was a Nazi official and a member of the SS, in which he reached the rank of SS-Obergruppenführer. In exchange for his testimony against his former superiors at the Nuremberg Trials, von dem Bach never faced trial for any war crimes. In 1961, he received an additional sentence of ten years imprisonment. None of the sentences referred to his role in the East and his participation in the massacres, though he openly admitted to having murdered Jews. He died in a Munich prison on March 8, 1972. 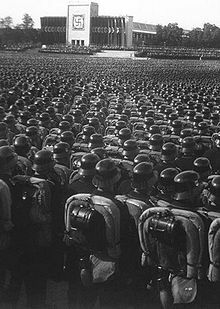 It has been said that Hitler particularly admired von dem Bach Zalewski's ruthlessness and ingenuity. Erich von dem bach Zalewski regularly associated with Hitler, having been fourth in line for leader of the Nazi party. Von dem Bach is so clever he can do anything, get around anything. Bach-Zelewski is a liar and a criminal — a terrible man. I repeat, he is a liar, a criminal, and a killer. I have proof of what I am saying about myself, but I know that Bach-Zelewski is a frightful liar. But to go back to Bach-Zelewski — I think Bach-Zelewski has the kind of personality that can't differentiate between the truth and lies. He gets himself so much into the whole thing he can't differentiate. He convinces himself and believes he has gone so far that he has to die for the cause. Originally it was not the truth, but he so convinces himself — he's ready to die for it. Herman Goering upon seeing Von Dem Bach about to testify at the Nuremberg Trials. This page was last edited on 16 February 2019, at 16:23.